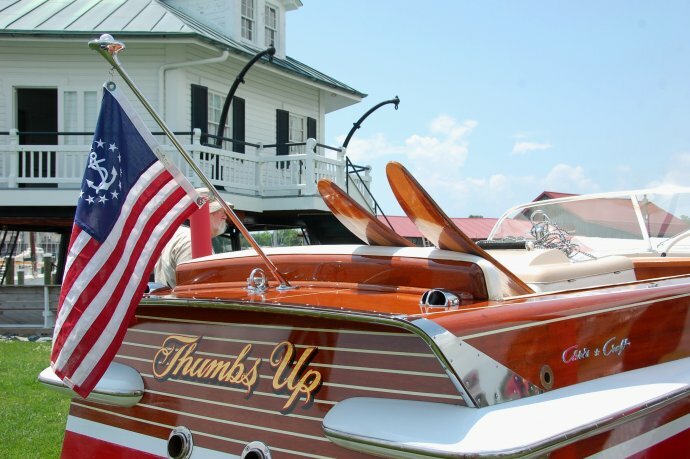 Wooden and fiberglass classics, vintage racers, and other antique and Chesapeake Bay-related boats are coming to the Chesapeake Bay Maritime Museum June 15-17 for the 31st annual Antique & Classic Boat Festival and the Arts at Navy Point in St. Michaels, Md. Hosted by the Chesapeake Bay Chapter of the Antique & Classic Boat Society, this Father’s Day weekend event brings a sense of nostalgia to the Miles River and CBMM’s docks and campus, drawing some of the area’s finest classic boats, nautical and maritime treasures, entertainment, food, and libations to this waterfront festival. This year’s festival highlights the history of ski boats and water skiing, with more inside CBMM’s At Play on the Bay exhibition building. Along with the mid-Atlantic’s largest gathering of antique and classic boats, the festival’s signature Arts at Navy Point pavilion brings more than 70 juried fine artists, craftspeople, and vendors offering nautical and maritime-themed items for boat and home. While at the Antique & Classic Boat Festival, guests can also watch the log-hull restoration of the 1889 bugeye Edna E. Lockwood, now underway in CBMM’s shipyard through her re-launch at CBMM’s OysterFest on October 27, 2018. Special exhibitions include Exploring the Chesapeake: Mapping the Bay, and Kent’s Carvers and Clubs: Guides, Gunners and Co-Ops. Scenic river cruises aboard CBMM’s 1920 buyboat Winnie Estelle will be offered throughout the festival, with boat rides and food an additional cost. For safety reasons, non-service dogs are prohibited at CBMM festivals. Festival parking for all three days and a Saturday shuttle service are free, with CBMM a short walk to specialty shops, restaurants, inns, bed & breakfasts, and other attractions in St. Michaels’ historic district. For more information about the festival, visit bit.ly/oldboatscoolfun or call 410-745-2916. For information about CBMM, visit cbmm.org, and for information on the Antique & Classic Boat Society’s Chesapeake Bay Chapter, visit chesapeakebayacbs.org.